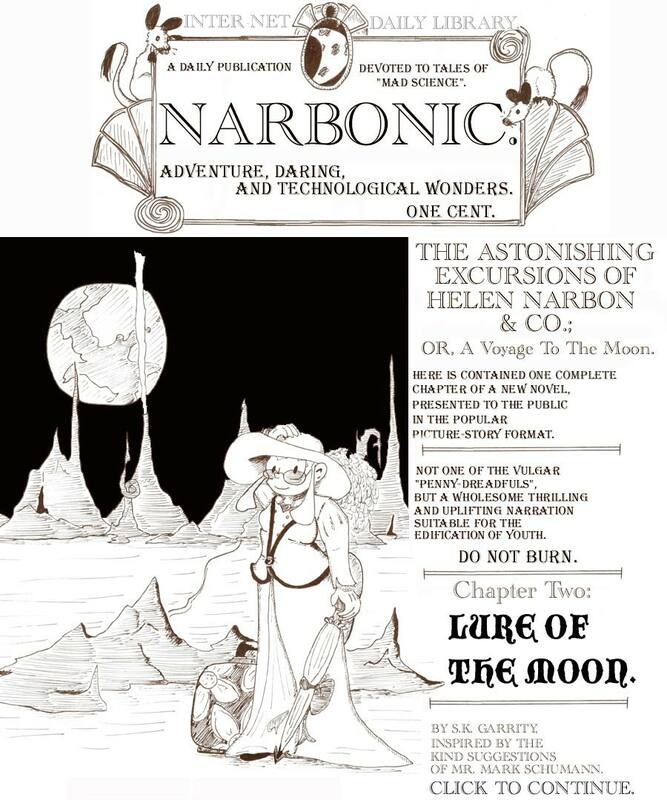 The Astonishing Excursions of Helen Narbon & Co, Chapter Two. Hey! Chapter Two of the Victorian serial! I think I originally intended to change the cover illustration from time to time, but I never did. Drawing the serial was always time-consuming enough. Sigh…eventually I would learn never, ever to use my own cursive writing. My printing is bad enough. 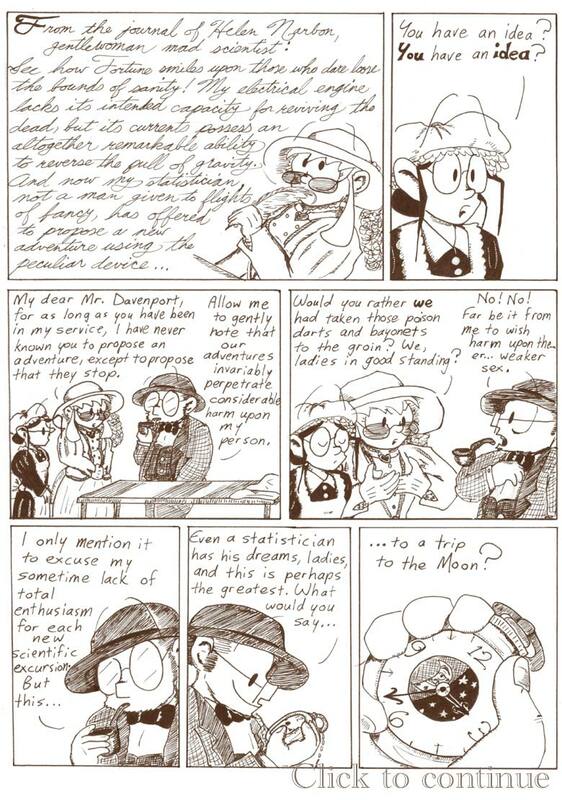 I still kind of like the pocket watch in the last panel, though. Dave’s computer is an IBM–the first IBM. It’s the Punch Card Tabulating Machine invented by Herman Hollerith in the 1890s to conduct the U.S. Census. Hollerith used his success to launch the Tabulating Machine Company in 1896, which later merged with a number of other early manufacturers of computing and recording machines, forming the International Business Machines Corporation in 1924. Mell, meanwhile, has a carpetbag full of 19th-century rifles and a brace of World War I-era grenades. 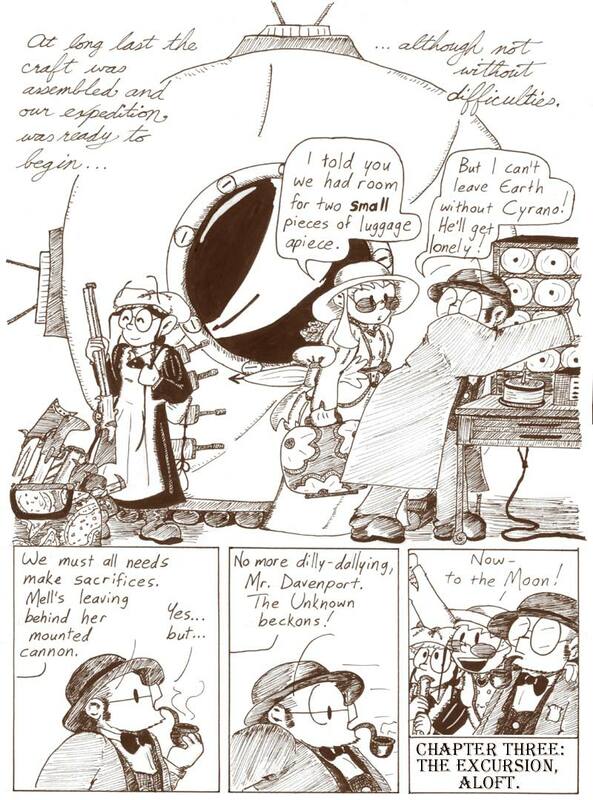 It’s not the most historically consistent panel, but it’s also a panel of mad scientists flying to the moon in an antigravity bathyscape, so how much realism do you want? On seeing that most complicated wooden device, I automatically assumed that it was a davenport. Only upon learning that neither of the two furnishings known as davenports resemble this contraption (which happened three minutes ago) did I realise the truth. Another unsolved mysery: which of these Cyranos is our dear PCTM named after? But upon reading that page, it occurs to me that Jones is an equally likely candidate. Hah, thank you for answering my question about the name before I even asked it. I love the fact that it’s a gondola. Much-belated Big Freakin’ ™ Gun count: 2. A compromise between the fact that the guns show are big (but not that freaky), and the off-panel mounted cannon. And yet, a couple issues later when they fight the Hapax Legomenon, Mell can clearly be seen in the background attacking him with a cannon! Perhaps she smuggled it on board, or does Victorian Mell have even greater control over Hammerspace than her descendent? 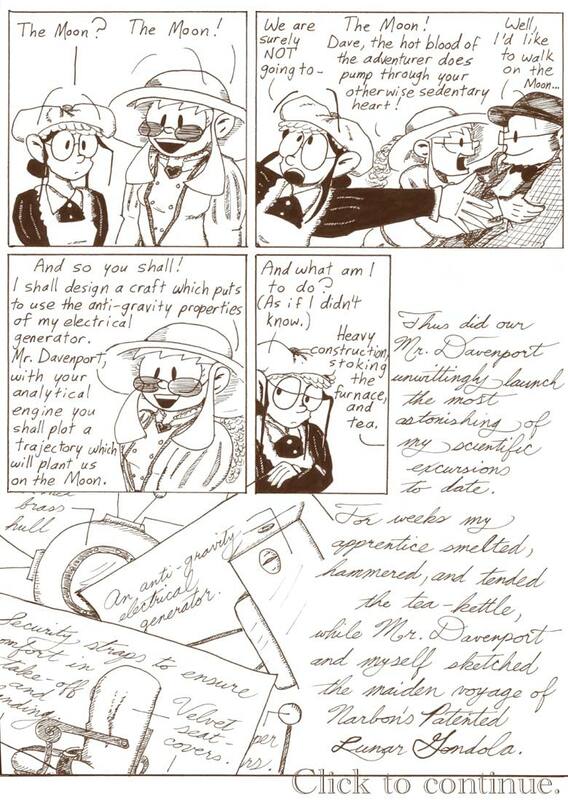 if only one of the characters in THIS storyline could have been Lovelace…maybe as Mr. Davenport’s mentor or apprentice? I actually like your cursive handwriting, though I understand why you gave it up. I too know some people who are chronically unable to read any text or font with any flair in it. A brace is a pair of something. Otherwise great strip! At least it wasn’t the era where people took pride in having unintelligible handwriting. Or at least, royal people did.